Dr. Doka is the Editor for Hospice Foundation of America’s monthly newsletter Journeys. 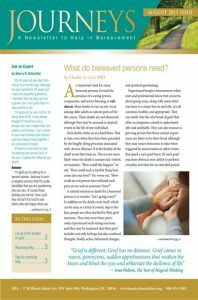 The newsletter is a publication offering support and practical advice for people coping with loss and grief. Each month, Journeys features articles written by experts in an easy-to-read style that speak to the many different aspects of the grieving process. Regular monthly features include experts’ answers to readers’ questions. For as little as $5.47, you can provide an entire year of bereavement support to a family or individual. HFA ships Journeys to your address. Your bulk subscription will arrive approximately 3 weeks in advance of the issue month, giving you time to compile your mailing list and then distribute Journeys. You maintain control of your mailing list and contacts, ensuring privacy. Choose flat or pre-folded options according to your needs. Click here for subscription information about Journeys. 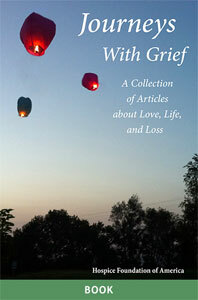 A collection of articles from leading grief experts about love, life and loss. Provides self-help tips for those who are grieving and guidance about what to expect following a loss. Articles address topics including loss of a spouse, child, or partner; grief during the holidays; suggestions for moving forward after a loss, and more. This 160-page volume (ISBN: 978-1-893349-15-5) speaks to those who have experienced loss and are seeking to understand the many feelings – relational, psychological, spiritual and physical – that are often associated with grief. Offering validation, consolation, tips, and words of encouragement, editor and author Kenneth J. Doka, along with authors Judy Tatelbaum, Charles Corr, Sherry Schachter, Earl Grollman, Patricia Loder, Bonnie Carroll and many others, confirms that there are no universal stages of grief and that each individual needs to find his or her own pathway in grief. If you are looking for answers about the grief experience, or if you have enjoyed Journeys: A Monthly Newsletter to Help in Bereavement, you will find this book to be a helpful resource. Doka, K.J. (Ed) (2006) Washington, DC, Hospice Foundation of America. Click here to purchase Journeys With Grief.